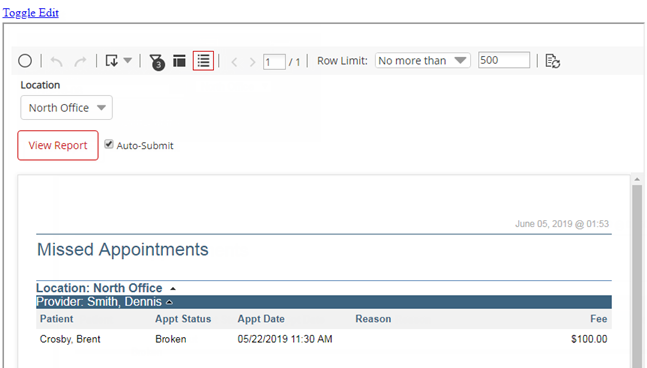 The Missed Appointments Report displays a graph that represents the number of missed appointments with each of the specified statuses. The report displays, for each provider, the number of missed appointments and the production that was not realized from those appointments with each of the specified statuses. The report also displays the details of each missed appointment. The report includes only missed appointments that are within the specified date range. On the Power Reporting page, click (or tap) the Missed Appointments icon. Select the Location that you want to view the missed appointments for. Then, if the Auto-Submit check box is not selected, click (or tap) View Report. 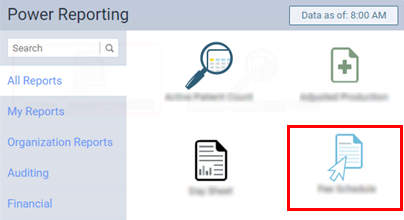 To Include appointments on or after a date other than the default date on the report, click (or tap) the Filter button , and then edit the Appt Date On or after filter. To ensure that the filter has been applied, you can click (or tap) Apply Filter.